20 Years Later, Rwanda Commemorates Genocide the World Ignored | Democracy Now! speaking from Kigali, Rwanda, where she is reporting on the commemorative events for the 20th Anniversary of the Rwandan genocide. She is BuzzFeed’s international women’s rights correspondent. Rwanda is holding commemorations for the 20th anniversary of the genocide in which 800,000 people were killed. On April 6, 1994, Rwanda’s extremist Hutu government and military began a campaign to exterminate the minority Tutsis. Men, women and children were massacred in an orchestrated, pre-planned campaign of genocide not seen since the Nazi Holocaust. The world claimed it was unaware of the magnitude of the slaughter, and the United Nations peacekeeping force stationed in the country stood by helplessly and watched the massacre unfold. Today, Rwandan President Paul Kagame will light a flame that will burn for 100 days, the length of time it took government soldiers and Hutu militia to carry out the killings. France has pulled out of the events following accusations by Kagame that it participated in the mass killings. We are joined by two guests: Jina Moore, international women’s rights correspondent for BuzzFeed, reporting from Rwanda, and Jean-Marie Kamatali, a former dean of the National University of Rwanda School of Law. AMY GOODMAN: Today, Rwanda is holding somber commemorations for the 20th anniversary of the genocide in which 800,000 people died. The Rwandan president, Paul Kagame, will light a flame that will burn for 100 days, the length of time it took government soldiers and Hutu militia to kill hundreds of thousands of people, largely Tutsis. U.N. Secretary-General Ban Ki-moon and several African leaders attended this morning’s commemorations. However, France has pulled out of the events following accusations by President Kagame that it participated in the mass killings. This is French Foreign Ministry spokesperson Romain Nadal. ROMAIN NADAL: [translated] France decided to cancel the trip of Minister Taubira, who was expected to lead the French delegation on Monday in Kigali for the commemorations of the 20th anniversary of the genocide. But we want to say that on the 20th anniversary of the genocide, we share the grief of the Rwandan people. We bow to the memory of all victims, and France will continue in the future its gestures of remembrance to pass on the souvenir of this genocide in order for it to be universally known. AMY GOODMAN: Twenty years ago, April 6, 1994, Rwanda’s extremist Hutu government and military led a campaign to exterminate the minority Tutsis. During the genocide, an estimated 800,000 people were killed in three months of systematic slaughter—men, women and children massacred in an orchestrated, pre-planned campaign of genocide not seen since the Holocaust. The killing continued for a hundred days. In Rwanda, the machete became the symbol of horror. As the situation in Rwanda spiraled into a bloodbath, the United States was careful never to call it a “genocide” because that eight-letter word carried obligations to intervene under international treaties. 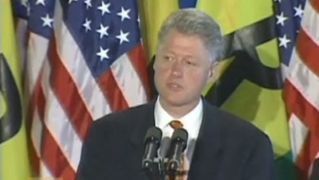 On a visit to the Rwandan capital, Kigali, in 1998, President Obama—President Clinton apologized for not acting quickly enough and immediately calling the crimes genocide. PRESIDENT BILL CLINTON: The international community, together with nations in Africa, must bear its share of responsibility for this tragedy, as well. We did not act quickly enough after the killing began. We should not have allowed the refugee camps to become safe haven for the killers. We did not immediately call these crimes by their rightful name: genocide. We cannot change the past, but we can and must do everything in our power to help you build a future without fear. AMY GOODMAN: President Clinton was speaking at the airport in Kigali. Last week at the International Genocide Prevention Conference in Brussels, United Nations Secretary-General Ban Ki-moon said the international community must draw lessons from the Rwanda genocide. SECRETARY-GENERAL BAN KI-MOON: The international community often proves reluctant to act, at times even when atrocity crimes are happening. The reasons may vary, from competing definitions of national interest to the complexity and risks of a given situation, to a perceived lack of capacity. There may be little appetite for due financial or military commitment. But is that a sufficient reason to look away? Is that not merely an echo of what we heard 20 years ago? AMY GOODMAN: For more, we go now to Kigali, Rwanda, to speak with journalist Jina Moore, reporting on the commemorative events for the 20th anniversary of the Rwandan genocide. She’s BuzzFeed’s international women’s rights correspondent. Jina Moore, you’ve just come from the ceremony. Can you describe what’s happening in the capital of Rwanda, Kigali? Jina, are you there? JINA MOORE: It’s—can you hear me? AMY GOODMAN: I hear you, yes. JINA MOORE: Great, sorry about that. It’s quiet in Kigali today. The streets are virtually empty. Almost all the stores are shut, and they were from this morning. And the stadium was full of people—dignitaries, VIPs, but also a lot of Rwandans who wanted to mark the commemoration, mark the anniversary of the genocide together. There were speeches. There was testimony by a survivor. There was a song-infused play that really seemed to move a lot of people. And there were also survivors in the stadium who experienced trauma. They say here they “get trauma,” is the language, and there’s wailing and crying, and they’re usually escorted out of the stadium and taken to a special room where there are counselors and mental health professionals available to help them. And there was a fair amount of that today, too. AMY GOODMAN: And can you talk about the latest words between the—between President Kagame and the French? JINA MOORE: What I know about that I know, basically, from international news reports. You mentioned that yesterday the French decided to pull out. The Foreign Ministry responded by disinviting the French ambassador to the ceremony this afternoon. There was only one phrase spoken in French in the play that happened today, and I’m going to paraphrase here, but it was something like: “There are countries that don’t truly understand what genocide was and don’t speak its truth.” And that was the only thing we heard in French in a play that was otherwise in Kinyarwanda and English. AMY GOODMAN: You just spoke to President Kagame? AMY GOODMAN: Did you recently interview President Kagame? JINA MOORE: I interviewed him about a week ago, and including with a reporter from a French newspaper. There were six print journalists there, all international. I was the only American. And they spoke about the relationship with France, which seemed on quite good and stable footing. But it seemed to be an interview that President Kagame gave to Jeune Afrique that perturbed the French a little bit and started a bit of a row. And that’s all within the last few days. AMY GOODMAN: Well, in the coming days, we will also look at what has become Rwanda’s role and Uganda’s role in the killings in Congo. But for now, Jina Moore, I want to thank you for being with us from Kigali, Rwanda. She has just come from the commemorative ceremony on this 20th anniversary of the Rwandan genocide, BuzzFeed’s international women’s rights correspondent. As we turn now to our next guest, Jean-Marie Kamatali, former dean of the National University of Rwanda’s School of Law, assistant professor at the Ohio Northern University Pettit College of Law—he recently wrote a piece in The New York Times called “Following Orders in Rwanda.” Can you talk about your own experience in Rwanda 20 years ago. Where were you, Jean-Marie Kamatali, when the killing started? JEAN-MARIE KAMATALI: I was at home. I was just living with my parents in a small town called Gikondo, which is actually one of the hottest places in Kigali. And the first thing we heard when—because it was the night—the night before, there was just a soccer game, and we were, you know, just watching the soccer. And then, in the morning, my mom knocked on the door and said, you know, “The president, Habyarimana, has been shot, and things will not be the same.” And at that time, we waited for the—you know, usually we wait for the Radio Mille Collines to kind of like broadcast and, you know, just declare whatever is going to happen. And my dad locked the door and everything. And we were attacked just a few—I mean, a day after. And a family member, which was—not family member, just a neighbor helped us. And we were just kept there for days, because the militias were saying that they will kill people, and then they will kill others on the 23rd, because they were saying that the president will be—I mean, Habyarimana will be buried on the 22nd. So, that’s how, in between, we managed to escape. And I—you know, it was a long ride for me, because a family friend helped me and put me in his car and as—I mean, he declared that I was his son. And then we drove, roadblocks—people were killed and everything—and until I reached in the southern part of Rwanda, where actually the worst happened, and, you know, a lot of people were killed and everything. And I just managed to escape swimming through the lake to DRC, and that’s how—you know, I’m just putting it short, but it’s a kind of road that took me almost a week. And that’s really horrible. AMY GOODMAN: In your reference to the death of the president before, explain what happened, the plane crash that killed the presidents of Burundi and Rwanda right before the genocide began. JEAN-MARIE KAMATALI: The president of Rwanda, I mean, Habyarimana was in a conference in Dar es Salaam, and he was with the president—different presidents in the region, including President Mobutu and president of Burundi. And then, on the way back, that’s how his plane was shot down at the airport, just in the airport, and the plane just happened to land almost in his backyard. And that’s—but this is something for many people didn’t know. And we knew that, actually, before there were militias, they were, you know, danger—you know, they were dangerous, but we—as many civilians, we were really trusting. We were trusting the U.N. We had, you know, peacekeepers. And as much as we thought, you know, things may be bad, most of us trusted very much the United Nations, because they were over there. And we knew that many people may be killed, there may be danger and everything, but the United Nations and the new government that was actually formed, that included that Habyarimana government, but also the RPF, which had just entered Kigali, and they were going to create a government. So, for most of us, we thought peace was possible. And we may—you know, probably we were wrong, but we thought it was not going to be the way it happened on the night of April 7th. AMY GOODMAN: I want to turn to General Roméo Dallaire. He led the U.N. peacekeeping force sent to Rwanda in 1993. In an interview on Allan Gregg’s TV show in Canada, he reflected on why the U.N. ultimately refused his request for more troops as the genocide started unfolding. LT. GEN. ROMÉO DALLAIRE: —and the reaction of the Americans and President Clinton, who said, “We will not intervene anymore unless it’s in our self-interest,” and the fear of casualties spooked the international community, and no one wanted to get into the middle of this complex problem and take casualties. AMY GOODMAN: That was General Roméo Dallaire, who was head of the U.N. peacekeeping force, referring to Somalia the year before, where the U.S. lost 18 military in what has come to be known as Black Hawk Down. Jean-Marie Kamatali, did you feel abandoned by the world at this point? JEAN-MARIE KAMATALI: I’m sorry. Did I…? AMY GOODMAN: Did you feel abandoned by the world? JEAN-MARIE KAMATALI: Exactly. And this is actually what people needed in Rwanda, is just during that time what people needed was at least hope that there was something that could be done, because you could—I remember when I was hiding in bushes in one roadblock. There was some U.N. soldiers. And they were just in one big building, and they were just on top of one building. On top, you could see them just looking down, a guy with, you know, a gun and everything. And I looked, and I said, “This is the United Nations. This is the organization that was created to just stop, or at least for the 'never again' after the Holocaust.” And that is when you know that—you look around, you look up, you look everywhere, and you know that you’re abandoned. And many people actually gave in, and they accepted death, because they didn’t know what to do, because there was no hope. There was nothing. And you look—you look at the United Nations, you look at the government, had abandoned you. You look at your parents. You look—you know, people who told you that you have to be strong and everything. And, you know, the dreams you had for many years when you say, “OK, I’ll be this,” and then you reduce that in a month, and then days. And then, at some point, you wish you could be just alive for an hour or for 10 minutes, for a few minutes. And that’s when you just get traumatized, and you give in. And I know many people who did that, because there was no hope. So, the United Nations abandoned Rwandans. The United States abandoned Rwandans. And it’s very, very hard to kind of like—for many people to trust again the international community and see that things are going to be different, although things are getting better now. When we come back from break, what was the U.S. awareness at the time? We’ll look at the documents that the National Security Archive has now gotten a hold of and released, and we’ll speak with a professor who has written several books about Rwanda. What did the U.S. know? What did the French know? Why did—why would the U.S. not invoke the word “genocide”? Stay with us.